Many American people today are so used to living in a democratic society that they don't realize how special democracy is and how lucky they are to live in a country that has a democratic government and way of life. In this highly entertaining and cleverly written book, readers will explore the history of democracy in America, they will come to see how this system works, and they will come to understand what the Founders were trying to do when they wrote the Declaration of Independence, the Constitution, and the Bill of Rights. For each letter of the alphabet a new word is introduced. A short poem captures the essence of the word's meaning, and then a longer piece of text explains the word in more depth. The poems are perfectly suited for young children, whereas the text provides the kind of information that would interest older readers. The book can therefore be enjoyed on multiple levels and will grow with the reader. Amusing illustrations with caricature style artwork provide a wonderful backdrop to the poems and text. Readers will be able to read about the Bill of Rights, voting, Congress, religious freedom, taxes, Uncle Sam, elections, the Founding Fathers, and much more. Throughout the book there is the strong and compelling message that all of us are part of the democratic system and that we all have to do our part by voting, asking questions, learning about democracy, and by keeping ourselves informed of what is going on. 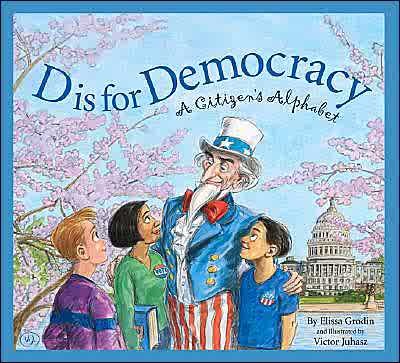 The author concludes by giving her readers suggestions on how they too can get "involved with democracy."